The domain rules for Adventurer Conqueror King System are mostly contained in chapter 7: Campaigns. This chapter covers advanced magical research, accumulating divine power, building strongholds, and mercantile ventures. Basically, this chapter is about what high level characters can do. First up are options for high-level mages. Mages can create many different kinds of minions: constructs, undead, cross-breeds. The general formula is 2000 GP per hit die plus 5000 GP for each additional special ability plus 5000 GP per plus on the magic research throw (and some one-time facility costs). There are some other minor differences between the required components, but the creation template for all minions is approximately the same. The limit here is fundamentally economic, as it seems like there is no other limit to the number of minions that can be created. Individual minion hit die total is restricted based on caster level. As a player, I’ve always loved having minions (that is probably why the necromancer is one of my favorite classes), so I think this is great. On to strongholds. In OD&D, everyone built castles, though guards and retainers varied by class. The list of possibilities given in ACKS are highly class dependent, and include, for example, border forts for the ranger-like explorer class, castles for fighters, sanctums for mages, and vaults for dwarves. It’s a nice list and we are treated to the standard info about how much gatehouses, towers, dungeon corridors, and walls cost. Personally, I would probably disassociate many of the strongholds with classes (or at least make some of them open to all classes). Not all thieves want to run a crime syndicate, for example. And if a mage wants to build a castle, become a king, and attract soldiers, why not? What better cover for the dark and arcane rituals that proceed deep beneath the keep? In any case, there is nothing wrong with the guidance given, and it is easy enough to overrule on a case by case basis. Elven fastnesses are settled by elven peasants. There are elf farmers? Do elves do everything that humans do, but just take longer and do it in a different language? To me, these elves and dwarves are really more like another nation of humans, but readers of this blog will know that this is more of a longterm personal issue of my own, and so it probably won’t come up for most players of ACKS (who I’m guessing are probably fine with standard fantasy elf nations and dwarf nations). I mention this only because in ACKS these assumptions about the nature of demihumans are baked into the domain rules. Many mages devote their later careers to magical research. This vocation demands a constant supply of rare components, generally monster parts, such as the fangs of 20 hellhounds or skulls of 50 ogres. Rather than squander their time hunting beasts for these components, many mages build dungeons within their domain with the aim of luring monsters to lair within. There they can be harvested at the mage’s leisure. Some results on the Wandering Monster table will indicate that NPC men, dwarves, or elves have arrived. These results mean that adventuring parties have come to clear the dungeon! Such encounters are best resolved by having the player whose mage owns the dungeon run a one-off session with the rest of the group playing as the wandering adventurers. The dungeon-owning mage may, of course, intervene personally when his dungeon is invaded. Thus, it all ends up tying together, almost seamlessly. Endgame PCs are the nemeses of starting PCs. It’s almost too clever. 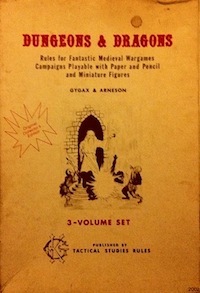 In fact, though this justifies pretty much every classic D&D dungeon delve, it does do away with one of the central old school dungeon design principles, which is that dungeons were originally built for something else and only later populated by monsters. It seems to me like a dungeon actually designed for housing monsters would have dramatically different architectural principles and dungeon dressing. Maybe I’m just being too picky though. There are other things you can do at the domain level. If you are running a thief, assassin, or elven nightblade, the default stronghold is a hideout and your followers end up being a criminal gang. You can earn passive income from your underlings, as they provide all kinds of shady services (ACKS calls them hijinks). Some examples are thievery, information gathering, and assassination. There are tables provided so you can (mostly) just roll for this rather than roleplaying it out. Once you accumulate a certain number of underlings, it would really be impossible to roleplay it all out anyways. There is also extensive information about penalties and costs for underlings that get caught. The system for resolving trade looks really complicated. Here are a list of some of the numbers and modifiers you may need to take into account to resolve a trade expedition: market price, base price, demand modifier, monopoly bonus, moorage and stabling fees, market class, market toll, modifiers for economic and political factors, labor fee for loading and unloading, customs duty, extra earnings for taking on passengers, and extra earnings for taking other shipping contracts. Whew! That’s a lot of moving parts. Maybe it’s easier in practice than it looks on paper, but if I had a character that was doing this regularly, I would probably write a program or build a spreadsheet to automate it. I should mention the tremendous number of prices that ACKS provides. It doesn’t matter to me if these numbers are exactly realistic so much as that they seem to make sense within the context of the other prices in the game. The price of land per acre is given. And many more such things. This is very useful, even if you don’t really care about all of the sums tallying. All these numbers really show the scale of the protagonists in ACKS. A single stronghold securing a portion of wilderness must cost at least 30,000 GP per six mile hex. The land value of 16 such hexes is given at over 1 million GP. One nice side effect is that hexes can only support so many people, so if you have a healthy and growing domain there will be expansion pressure. You need to send out the legionaries to secure more land. Which in turn requires increased defense investment to maintain the conquered land. Another option is to build a city, which can support a higher density of population. It looks like this will lead to a nice little sim city minigame. How many peasants do I have per hex? What do I have to spend to maintain the infrastructure? What do I earn in taxes? Has my population grown this month? That is determined by what looks like an exploding random walk to me, but I haven’t investigated the math in detail. I’m not sure if this is for everyone, but it certainly captures the actuarial spirit of AD&D. Finally, characters earn standard XP from many of these domain activities, such as building strongholds, earning domain income (if above a leve-based threshold), trading (also if above a level-based threshold), and expensive magical research. So you could theoretically sim city your character up a few levels, though of course any decent ref will present continuous challenges. Characters are more independent. When the characters started their careers, they needed each other just to survive. But now a few trolls present nothing more than exercise, rather than deadly danger. Now the characters aren’t as dependent on each other; each can survive and prosper as an individual. The persons with whom a character adventures are now more important as friends, than as as each others’ bodyguards. I think this is an important point regarding how the game changes from explicitly team-oriented at low levels to more self-reliant by the time characters start building strongholds. I have not read much discussion of this change in ACKS so far. I imagine many referees will by default favor an “Avengers Assemble!” style of play regarding domain level characters. By that I mean that between adventures, PCs will probably separate and go their own ways but then reunite to investigate the mysterious floating citadel (or whatever). Given that so many of the new rules that ACKS provides (over and above classic B/X) are focused on domain level play, it would be nice to see more discussion about adventure design and how it should change to accomodate powerful PCs. I haven’t read chapter 10: Secrets (the referee chapter) fully yet, so maybe there is more guidance there. My next post on ACKS will focus on the setting creation guidelines. This entry was posted in Uncategorized and tagged ACKS on February 12, 2012 by Necropraxis. Brendan – one quick note on the demihuman domains and monster domains – bigger domains have a slower growth rate, and smaller domains have a faster growth rate; an elf domain will grow slower than an equally sized human domain because it’s treated like a bigger domain for growth purposes; likewise, those humanoids breed quicker than humans (their domain is treated a few sizes smaller than it’s actual size for growth rate). I’m with you on the actuarial side of things – I need to build some good spreadsheets. I’d really like to try and design a small setting top down and get all the numbers to line up (players wouldn’t care, but I’d be happy knowing). Elven domains always increase in population as if they were two population categories larger. Dwarven domains increase in population as if they were one population category larger. Beastmen domains always increase in population as if they were two population categories smaller. Designing a small setting from the top down is exactly where I was planning on going with my treatment of chapter 10, actually. I’m going to try to build a setting from scratch and publish the results along with my rules musings (assuming the exercise doesn’t end up taking an obscene amount of time, though I really don’t think it will; the rules look pretty tight). The growth table is on page 129 in the growing the domain section. I think it got missed in the table index. Oh! Now I get it. I’m slow sometimes like that. Thanks for the clarification, again. Interestingly, elven and dwarven domains grow as if they were larger than human domains. And beastmen (creatures like goblins and kobolds) actually have slower population increase. Isn’t the stereotype usually that demihumans are rarer, more endangered, and slower to reproduce? And that goblins and the like are supposed to reproduce quickly? My guess is that this was probably dictated by some game balance concern. dungeons were originally built for something else and only later populated by monsters. It seems to me like a dungeon actually designed for housing monsters would have dramatically different architectural principles and dungeon dressing. yes. But there’s no reason this shouldn’t continue to be true: why dig a new dungeon when the world must already be littered with them? Especially when a bunch of the keeps and vaults and “towers” and whatnot could just as easily be underground as above ground? …I still haven’t read ACKS (it’s waiting on my hard drive), but the beastman thing already delights me. Why shouldn’t there be name level beastmen out there too, carving their own castles in the tufa? I actually don’t have any problems with name-level beastmen carving out domains, especially within the other race assumptions of ACKS (human-like civilization, etc, etc). But that option is not actually given in the core rules. I’m sure beastmen PCs will be made available in the Player’s Companion or some later supplement though. In core ACKS, chaotic characters may choose to not clear the wilderness of beastmen when carving out a domain (something that is an assumed action of lawful characters) and instead co-opt the beastmen chiefs (or kill the chiefs and co-opt their more pliant lieutenants). Then, the beastmen become the domain population. My confusion was with regard to the fact that according to the text, beastmen domains seem to grow at a slower rate than all other races, which seems to run against stereotype. But note that I was wrong about the population increase issue. Beedo set me right in the comments above. I’m not much of a fan of demihumans as merely a different shade of humans culturally. Of course making demihumans alien or culturally distinct takes a lot of work and a fair deal of research so I’m a bit more forgiving. What a wonderful idea. ACKS will definitely be on my shortlist as a result. Thank you for providing a substantial review. No problem, I’m glad it was of use.